The 3M 4565 is designed to offer a very good barrier to hazardous particles and limited liquid splash and spray. It features taped seams and a soft, lightweight material. Supplied in vacuum packaging.Type 4/5/6. Typical applications may include: Paint Spraying, industrial and pharmaceutical manufacturing, asbestos inspection and handling, and Healthcare. 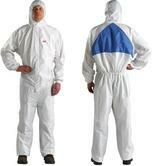 3M 4565 Disposable Protective Hooded Coverall conforms to: CE Category III. EN340 Type 4/5/6. EN530. EN863. EN1149-1:1995.EN1073. EN13274-4. EN22610. safety standards. The 4540+ protective coverall from 3M is disposable breathable suit made of a high quality laminated material. Comes with a breathable blue back panel for improved air circulation. The 4540+ coverall helps provide barrier protection against hazardous dusts and light liquid splashes. 3M Disposable Protective Coverall 4540+ standards: EN 1149-5 - Electrostatic Properties, EN 1073-2 Particulate Radioactive Contamination, EN 13034:2005+A1:2009 Type 6 Liquid Splash, CE Category III, EN ISO 13982-1:2004 Type 5 Hazardous Dusts. The Protective Coverall 4530 is a PPE Directive, CE Category III and Conforms to Type 5/6 protective garment. Coverall is made using breathable SMMS material technology and a host of comfort features additional special protective treatments. The 3M protective coverall 4530 is an excellent barrier from dry particles and certain limited liquid chemical splash, 4530 coverall has a limited "flame-spread-resistance" (FSR) treatment. 2-way zipper with storm flap for extra protection. Knitted cuffs with elasticated ankles and waist for increased comfort and freedom of movement. The 3M Protective Coverall 4515, ideal choice, If you are looking for a balance of durability, protection,quality and additional comfort. Made of lightweight and breathable polypropylene and does not contain any components made from natural rubber latex to prevent reactions with latex sensitivities or restrictions. 3M Disposable Protective Hooded Coverall 4515 Type 5/6 conforms to: EN 1073-2 Particulate Radioactive Contamination, EN 13034:2005+A1:2009 Type 6 Liquid Splash, CE Category III, EN ISO 13982-1:2004 Type 5 Hazardous Dusts. Use our Buyers guide to choose your most suitabel disposable suit, coverall of coat. The Type 5/6 protection for varies in terms of protective suits that do/dont have a hood or that are FR resistant compared to most which are not. Disposable coveralls or suits are available with Antistatic features and great breathability on the back, such as the 3M4540, and also in white or blue, with taped seams. 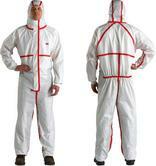 3M disposable suits are most closely compared with Dupont Tyvek type 5/6 suits.